« Catalogue Update: Infos About the New Jackets, Mob Action New and Re-Stocks, Antifa Flags, and Stickers! As an anarchist, the deaths of politicians were usually something I met with something between indifference and joy. Maybe it is the distance to the events, or maybe my Latin American sozialization has created an unconscious sympathy towards the „caudillo“ figure, present emotionally although rejected rationally. Or maybe, even more irrationaly, the reason is his fanaticism for Racing Club. 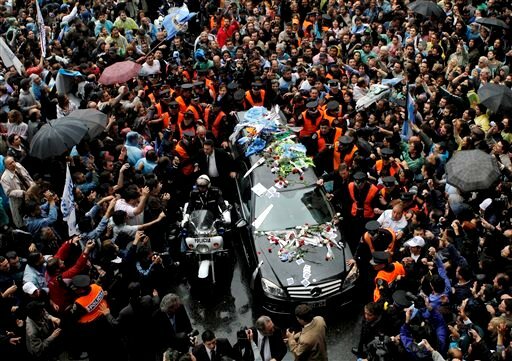 Whatever the cause may be, I cant help but feel that the death of Nestor Kirchner is a negative and unfortunate event. I know full well that the project of „Kirchnerismo“ has very little to do with that of a liberated society, free from capitalism, classes, and state. I know that their politics are often little more than lip service to left-wing ideas, at best a left leaning populism. I know that if I was in Argentina, and when I was in Argentina, my place was never among the supporters of the ruling party, but with the radical left who didnt stop fighting for a better alternative. The Argentina of Kirchnerismo is still an Argentina of capitalism, inequality, and poverty. But the fact remains that the better alternative is not what will follow in the absence of Nestor Kirchner. Just as I am certain that the Argentina of 2010 is a much better place to live in than the Argentina of 2001, I am certain that the reactionary, nostalgic, coup sympathizing opposition would offer nothing better. Against the status quo of Kirchnerismo and for social revolution, definitely. But in defense of Kirchnerismo against those who want to turn the clock back in Argentina…as well.